Polls find the majority of U.S. parents don't want to put their kids in public schools, but most do anyway. A new book explains why they should stop, and here's a gameplan for achieving that. Those numbers combine both “satisfied” and “very satisfied.” If you take out the “very satisfied” proportion, the gap widens even more. “Parents were twice as likely to say they were very satisfied with their private school experience compared to the proportion who said they were very satisfied with district schools,” the poll report notes (emphasis added). These numbers would surely plummet if more parents actually knew what was happening in their kids’s public schools. That is the subject of a new book every parent should read: “Get Out Now: Why You Should Pull Your Child From Public School Before It’s Too Late,” by Mary Rice Hasson and Theresa Farnan (disclosure: my endorsement appears on the cover). It surveys just how bad American public schools have gotten, and argues all conservative and religious parents should get their kids better schooling, stat. Yet will their accurate assessment move parents where previous efforts have failed? As Hasson mentioned in a Federalist Radio Hour conversation with me, the book argues that public schools’ unavoidable capitulation to transgender ideology is a Rubicon no family should follow them across. Public schools are at the cruel mercies of many intersecting terrible court decisions that make them instruments of force in the hands of LGBT activists who support doctors performing double mastectomies on 13-year-old girls and creating the social conditions that lead impressionable girls into thinking that may be a good idea, all while rendering parents powerless to stop it. The best way to protect children is to prevent their contact with this social ecosystem rather than try to put their emotional and intellectual toothpaste back in the tube after it’s almost inevitably been squeezed. “Get Out Now” quotes a litigious LGBT activist telling media she knows of no instance in which public-school parents successfully protected their children from transgender ideology. The book’s authors found only two instances nationwide, ever, of conservatives winning school board victories on this issue, and those were narrow victories that provoked backlash likely to quickly reverse them. Other local school board wins for conservatives on other issues have universally suffered the same fate. All trends in U.S. public education have been irreversably left for more than a century. Every time trans activists demand a public school or school district capitulate, they win. Parents want to believe they can overcome or ignore this, but the facts show that’s a self-delusion that leaves children vulnerable to people who push laws allowing 12-year-olds to medically self-mutilate with no parent knowledge or input. Prevention is far wiser than seeking a post-contagion cure. This is an all-encompassing problem for which transgenderism is merely a particularly bright mine canary. As Hasson and Farnan point out, public schools’ curricula and teaching methods are about as informed within their domain as transgenderism is in reference to reality, and the K-12 humanities in particular have turned towards breeding ignorant political activists rather than informed citizens. Several other pieces of social science underscore the reality that indoctrination in alternative sexualities is a particularly potent weapon against faith (and conservatism), and is particularly strong in public schools. For example, emerging research suggests that transgenderism flourishes where heterosexuality is condemned and identity politics rife, and that sexual experimentation is socially contagious — in other words, regularly encountering anti-science, anti-religion gender ideology makes it more likely that children conform to it. Other social science has long found that public schools are key to breeding “youth culture,” in which children oppose themselves to the adults in their lives rather than aspire to become like them. Public schools are breeding grounds for peer-driven conformity, for many reasons that include their massive sizes, grouping children by age instead of ability, inability to espouse concrete and robust morality, and curricula that de-emphasizes knowledge, because knowledge allows for independent, critical thinking. Trends for political beliefs parallel those for religious beliefs, making public schools not only secularizing but also collectivizing institutions. Add to this that sexual profligacy is a particularly strong way to separate children from their family’s faith, as Mary Eberstadt’s “How the West Lost God” underscores, as well as myriad polling data showing that support for sexual profligacy highly correlates with secularization. This web of interrelated factors all converges within public schooling, an institution that now very clearly secularizes children, Hasson and Farnan convincingly argue. In public schools children are not only repeatedly exposed to dangerous, socially contagious ideas like alphabet soup genders, but in a context that shames and actively excludes religion. While religiousity among students was declining for several decades, it dropped precipitiously as progressivism swept through the culture and saturated the public schools. In 2016, a large-scale, nationwide survey of college freshmen — described as the most politically liberal generation since the 1970s — found that 30 percent of freshmen declared their religious affiliation as atheist, agnostic, or ‘none,’ a figure almost twice as high as their parents’ and sharply higher than the previous decade. Keep in mind that the students surveyed had barely begun freshman year…their religious views reflect the cumulative influence of twelve years of predominantly public education, not the influence of radical college professors. They cite a 2016 Public Research Religion Institute report that finds “young adults today are nearly four times as likely as young adults a generation ago to identify as religiously unaffiliated,” research finding this trend goes back at least to middle school, and other research that finds people who lose their faith rarely come back. All the above, plus everything Hasson and Farnan cite, is backed up by plenty of other sensible observations and data. That includes 30 years of surveys to approximately 117,000 children attending various kids of schools from the Nehemiah Institute. 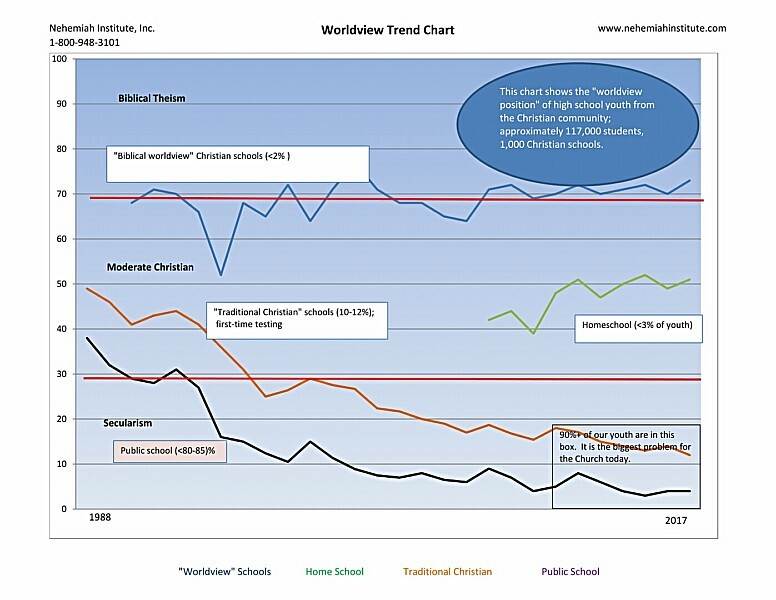 Their overall results — that public schools are an actively and strongly secularizing agent in Christian children’s lives — are depicted in the graph below. The question is: Will parents continue to dismiss the strong evidence for this argument to preserve their psychological and economic comfort, just like they did back in the 1980s? We’re seeing the results of baby boomer parents making that choice a generation ago. The kids born in the ’80s and ’90s are today’s millennials, who are the least religious, most politically wackadoodle, and possibly most religiously and historically illiterate generation in American history. Hasson and Farnan argue that this makes perfect sense. The environment in which children are raised deeply influences their outlook and behavior. And parents have not meaningfully controlled public schooling for half a century. As I detailed in my own book last year, the Common Core fiasco made that abundantly clear. “Local public schools” are a myth. Public schools are now merely local outposts of a large, metastasized conglomerate controlled from the top, largely by unelected bureaucrats whom elected representatives refuse to control. These bureaucrats are largely hostile to the majority of Americans’ desires for education, as Hasson and Farnon also demonstrate, and expecting anything to change within the current generation’s school years is a fool’s game. Parents just need to get their kids out, and fast. Republican politicians, who control a majority of legislative houses in the country and have for several election cycles, love to rail against “safe spaces” and “identity politics” in education while taking hardly any significant steps to destroy the interlocking education monopolies that allow this environment to fester. While observing the terrible outcomes of American education that are impossible to ignore, they seek refuge from doing something about it in cognitive dissonance. Rather than understanding this reality, Republicans are often right out there leading campaigns to increase funding to ideologically hostile education systems, rather than using their political power to upend their cultural opponents’ recruiting and indoctrination centers. Like many parents, while observing the terrible outcomes of American education that are impossible to ignore, they seek refuge from doing something about it in cognitive dissonance. You see, doing something about it would require courage and clarity. Hasson and Farnan provide that to those who are willing to consider their arguments with an open mind. Their Q&A section at the back is actually where I recommend parents start in the book, after perhaps the first chapter or two. Here are some additions of my own to help conservatives and people of faith get started, so people like Hasson and Farnan don’t sound the alarm in vain. If you have kids or plan to have kids, get your finances in order so you can fund your school choices. It’s not as hard as you might think, although it might require cutting cable, paying down your debt, or choosing a smaller mortgage. Helping your children flourish is absolutely worth it. You would do this for their physical health, wouldn’t you? Their spiritual and mental health is far more important. Your family spending should reflect that. Here are two good resources to get you on track. If you have kids, pull them from public school and enroll them in something better. If there is nothing better, make something better, and get other families to help. If your only or preferred option is homeschooling, this and this are good, off-the-shelf and reliable places to start. Here’s another if you want to do more curricula selection yourself. If you don’t have kids, help fund private education for a family you know or through your church. I would start with those closest to me — family members, close friends, church members — and work my way out. If you are a religious lay or clerical leader, arrange for your church to publicly discuss why educating children in the faith deserves serious personal and institutional financial support. Perhaps start a book club to discuss these issues using Hasson and Farnan’s book. Make it standard that your church helps all member families attend private religious schools. If there a no high-quality private schools in your area, and you have enough determination, collect several other parents and local leaders to discuss starting a new, high-quality religious school, either in the traditional full-day or one of the many hybrid models that can lower costs (all models have advantages and disadvantages — that’s something for local communities to decide). Everyone should call his state representatives right now and demand bigger, better school choice programs. Here is an overview of what is already available in your state, but all existing programs have lots of room for improvement. You can get your lawmakers’ contact info right here. Get on the emailing list for an in-state organization that supports private school choice and lobbies your state lawmakers on that issue. Respond when they issue calls to action or hold events. You can find those at the State Policy Network, or through state affiliates of the American Family Association, Heritage Action, Home School Legal Defense Association (homeschooling only, natch), and Americans for Prosperity. If you are a lawmaker or work with them, propose this bill and work to get colleagues’ support. At the very least, force them to take votes on the record for or against it. Federal policy makers, your role is to cut the U.S. Department of Education so local communities once again control their public schools. Federal school choice plans will only create a Death Star by which activists can nuke all private options by capturing one target. Here’s your gameplan. If you are involved in local political or community organizations, propose that they hold an event about school choice, perhaps if fitting with a book talk about what’s inside Farnan and Hasson’s book. Have everyone, while at the event, email their representatives to demand they pass or expand school choice. Political campaigns, parties, and donors should make tangible, demonstrated support for genuine school choice a litmus test for candidates and a lack thereof a reason to primary incumbents.